7th Annual Spectrum Summer Sing! Music & art camp for kids entering grades K-5. ​This popular camp includes four exciting days of singing, movement, arts and crafts, rhythm, note reading, music theory, ear training, games and fun theme dress-up days led by our expert music instructors and experienced teen counselors. No previous music experience necessary. Before/after care available by prior arrangement - email us! Join us this summer! Register below. Camp newsletter and schedule will be emailed to registered campers a few weeks before camp. Campers should bring a lunch & water bottle daily. Dress for the daily theme & weather. Parents are invited to a short camp presentation on the final day at 12:30. Looking for a summer camp for older kids / teens? 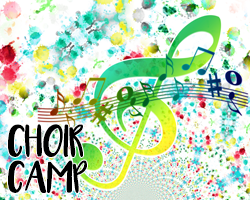 Check out Northwest Choir Camps - Honor Choir Summer Camp! A week-long overnight camp for experienced singers entering grades 6-12. We look forward to having you join us for the 2019 Spectrum Summer Sing! We will follow-up via email with payment details within 3 days of receiving this form. Thank you!